Six medals will be at stake when esports, or video gaming, will be held as a regular sport in the 2019 Southeast Asian Games. Medals for games involving three platforms, personal computers, mobile phones and consoles, are being considered. Philippine Southeast Asian Games Organizing Committee Chairman Alan Peter Cayetano (left) takes a selfie after formally announcing esports as a medal sport in the 30th SEA Games the country is hosting from Nov. 30 to Dec. 10. With Cayetano are (from left) eSports National Association of the Philippines President Joebert Yu, Games Developers Association of the Philippines Alvin Juban, New Clark City Athletes Village Mayor Arrey Perez, Chief of Mission Monsour del Rosario, Phisoc Executive Director Ramon Suzara, Razer Chief Strategy Officer Limeng Lee, SEA Games Council Executive Committee Chairman Celso Dayrit, Philippine Olympic Committee Deputy Secretary General Karen Tanchanco Caballero, ESPN Sports 5 Head Vincent Reyes, POC Membership Committee chairman Robert Bachmann and Razor Global ESports Director David Tse. Esports is on the official SEA Games program for the first time and the Phisgoc has secured Singapore-based global lifestyle brand for gamers Razer as official partner. Esports officials Joebert Yu and Alvin Juban talked about the involvement of video gaming in the biennial meet after announcing that Razer, a Singaporean global gaming hardware manufacturing company established in 2005, will provide technical support and advise. “Right now, it’s still in the process (of discussion). A lot of gaming developers and publishers are talking to us,” said Yu during a presentation at the Marriott Hotel in Pasay City. Juban added that they considering the suggestion of many developers who are coming from around the Asian region to pitch in to help find the right video games to played in the SEA Games. “Everyone is inclusive here on all platforms,” said Juban. 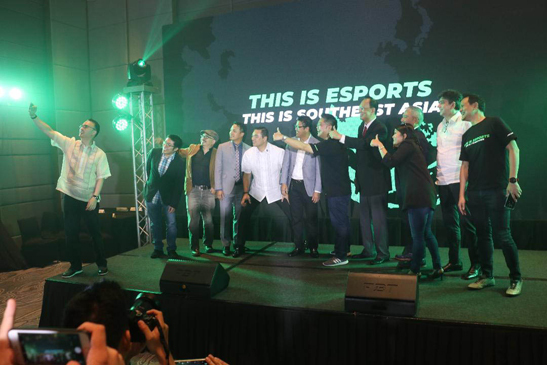 Yu belongs to ESNAP, or Electronic Sports National Association of the Philippines, while Juban is part of NESFP, or the National Esports Federation of the Philippines. These two groups are seeking recognition as the national sports association for esports before the Philippine Olympic Committee. Officials of the SEA Games Federation council have advised the gaming community to choose games which will not promote the culture of violence and gambling, according the council’s executive committee chairman Celso Dayrit. In the absence of an NSA in esports, the Philippine SEA Games Organizing Committee, led by chairman Allan Peter Cayetano and Phisgoc executive Ramon Suzara led the formation of an ad-hoc committee to oversee the preparation and organization of an e-games event in the country. The adhoc committee will be working with Hong Kong-based Asian E-Sports Federation on the conduct of the tournaments that they will stage. Yu, who is part of the adhoc committee with Juban, explained that they will determine what games will be played within the next two months. Razer, according to co-founder and CEO Min-Liang Tan, is elated that esports had been recognized as a medal sport for the first time in history. Their involvement, according to Tan, marks a milestone in their quest to boost the global status of e-sports. The company has been designing and providing hardware that is being gaming competitions worldwide, and for more than a decade.